Since opening in 2006, Nopa quickly became one of the quintessential restaurants in San Francisco. Serving up delicious American fare in a beautiful rustic space, it’s easy to see why this spot is so popular. 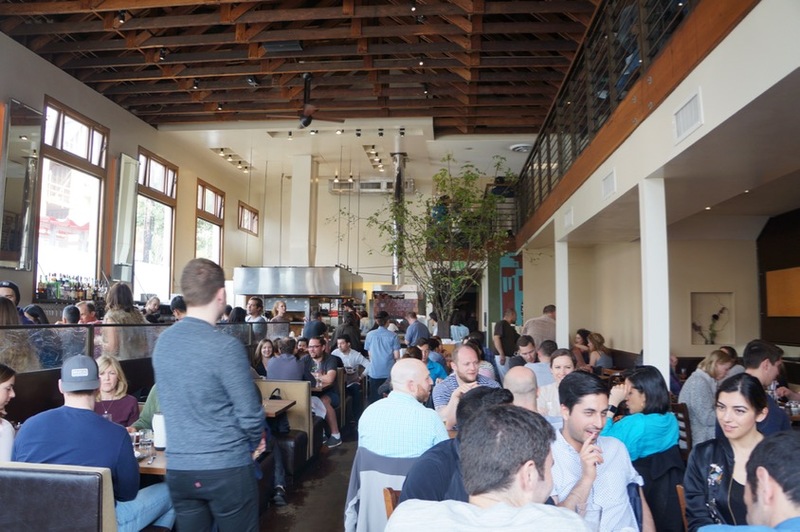 The restaurant shares the same name as its neighbourhood, NoPa, and is located on Divisadero Street, just west of Alamo Park (the park with the best viewpoints of the ‘Painted Ladies’ – colourfully painted Victorian houses that people typically associate with SF). The restaurant occupies a large space with a second floor loft which has a great view overlooking the dining room and open kitchen. There’s a variety of seating options including bar seating, communal tables, regular tables and cozy booths. The space has a rustic feel to it which gives the restaurant a warm and welcoming atmosphere. They are open for dinner every night and for brunch on weekends. Since Mike and I already had all of our dinners booked, we decided to drop by for brunch. 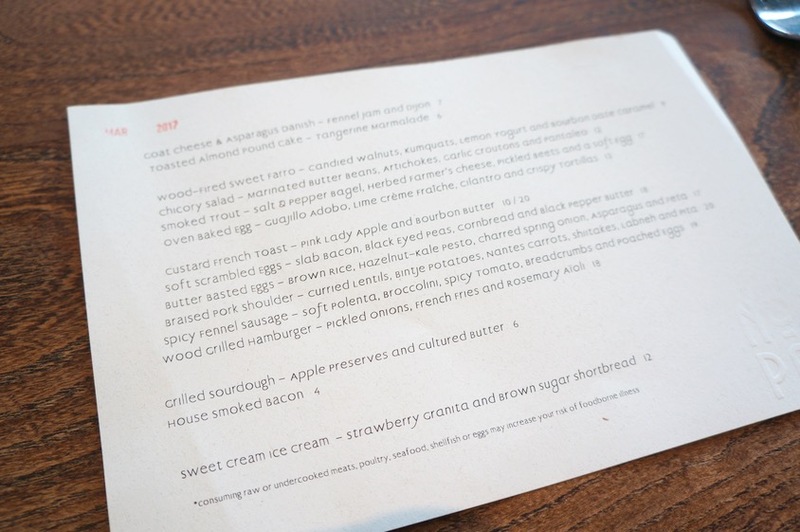 The best part about brunch at Nopa is that they take reservations! They also take walk-in’s but the waits can be pretty terrible – a group of two in front of us tried walking in and were quoted a 1.5 hour wait. According to their website, they “serve simple food created with seasonal ingredients sourced from local purveyors” which is certainly evident in their menu. For brunch, they offer a mouth-watering selection of dishes, most of which fall into the $15-$20 range. 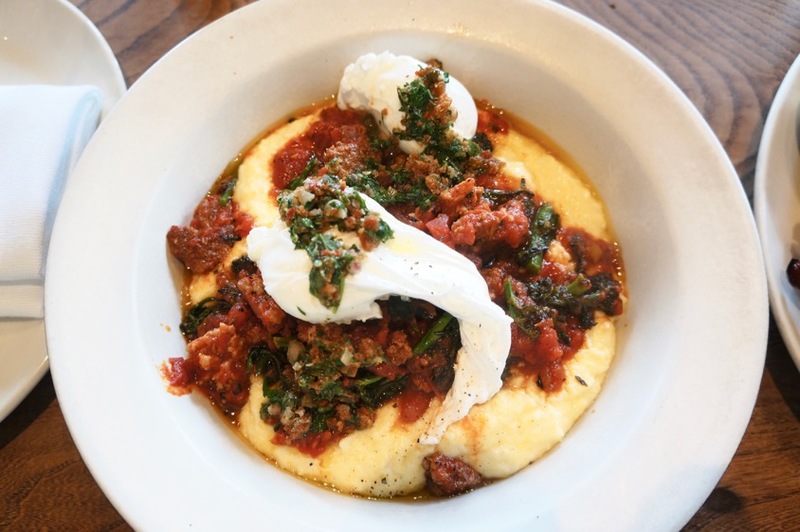 One dish that caught our eye was the Spicy Fennel Sausage – soft polenta, broccolini, spicy tomato, breadcrumbs and poached eggs ($19). This kind of brunch dish is right up Mike’s alley. Two perfectly poached eggs with a spicy tomato sauce and ground sausage sat on top of a bed of creamy of polenta. The sausage had a nice kick but wasn’t too spicy and I loved the slight bitterness from the broccolini. I also enjoyed the breadcrumb topping which added a nice crunch. All in all, it was one hell of a brunch dish. 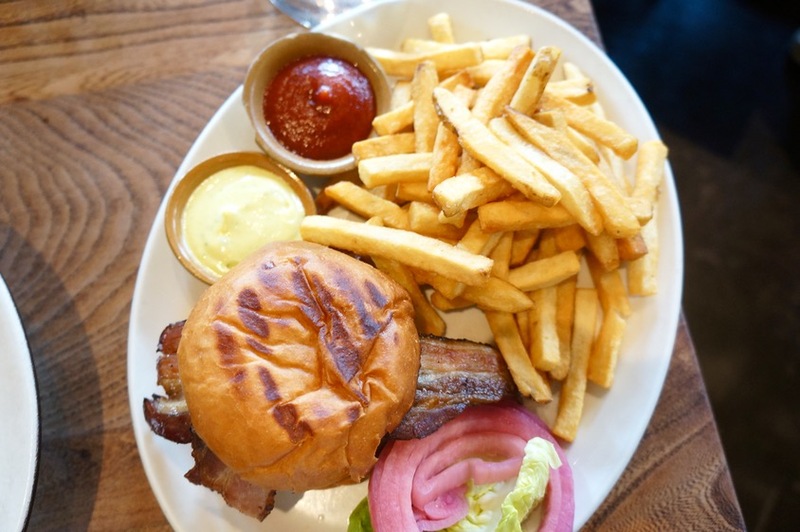 We also shared a Wood Grilled Hamburger – pickled onions, French fries and rosemary aioli ($18). While it’s not a brunch burger, having read so many great things about it, we couldn’t go to Nopa without trying it. The juicy and beefy patty was served on a toasted brioche bun with pickled red onions and a long slab of bacon. Without a doubt, it was a very good burger but having eaten so many great burgers (especially in Toronto), I didn’t find this one particularly memorable. The burger was served with a mountain of thick cut fries. Mike really enjoyed them but personally, I’m a fan of thinner and crispier fries. The rosemary aioli and house ketchup were fantastic though. I cleaned every bit of those condiments up with those fries. 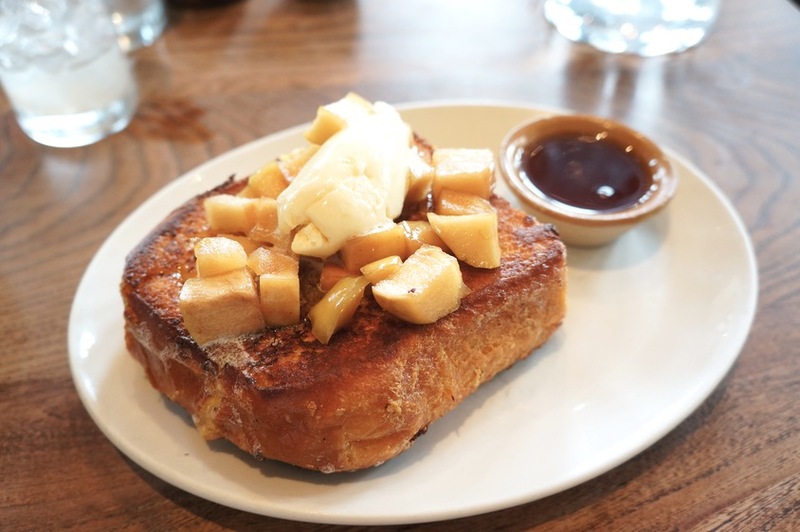 The Custard French Toast – Pink Lady apples and bourbon butter ($10 half/$20 full) is a must-order. We ordered a half order for dessert. It’s so great when restaurants offer their sweet brunch dishes in half orders! I’m normally not a big fan of custardy French toast but this was a game changer. It’s crazy how eggy and custardy they’re able to get it in the middle. All in all, we had an awesome experience at Nopa. The food was excellent, the service was attentive (I polished off all the ketchup that came with the fries and without even asking, a refill was brought over to our table), and the atmosphere was incredibly warm and welcoming. Like I said, it’s easy to see why this is such a beloved San Francisco restaurant.